I wish I had known about Noiseware Professional 4.0.1 a few weeks before I downloaded it. I was working on some images that I had taken in low light, using Photoshop CS2’s built-in Reduce Noise filter. I thought it yielded pretty good results by reducing JPEG artifacts and color noise from uneven skin tones. However, I was dismayed by both the blurriness in the detail of my image and with the magenta color cast that appeared after applying my filter. The blurriness could have been avoided, but it would have taken hours of tweaking to select the areas I wanted blurred and separate them from the areas I wanted to sharpen. As a workaround, I ended up using the History Brush Tool to paint back the areas I wanted sharp. 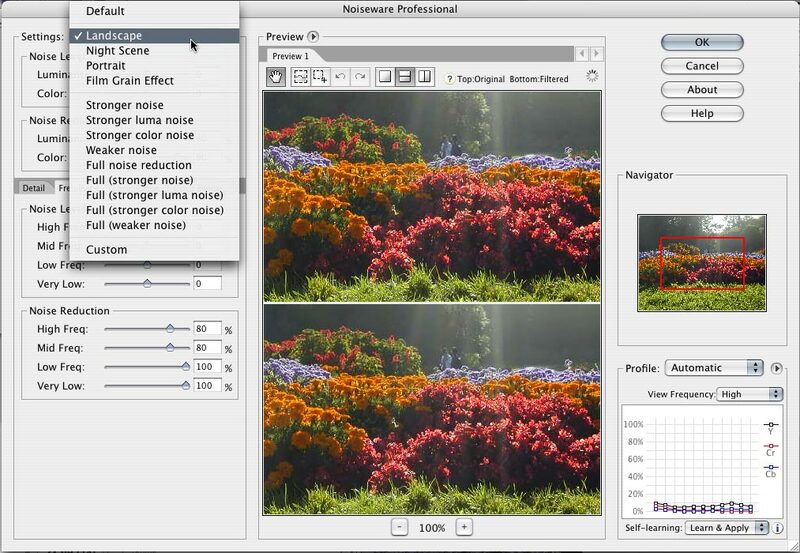 However, after working with Noiseware for just a few minutes, I began to see a real difference in the quality and control it delivers to combat noisy images—and how amazingly fast it performs. It has by far the best fine-tune adjustments I have ever used. By tweaking the plug-in’s image properties, such as detail, tonal range, color, and frequency, I was able to boost the image quality significantly. I was also able to save my settings and batch process my images. When you launch the plug-in, a Settings pull-down menu, lets you select a preset such as Landscape, Night Scene, Portrait, or Film Grain Effect, as well as quite a number of specific settings that you can adjust. The Image Preview window contains a Pan tool, two Region Select tools, Redo and Undo tools, as well as one-up and two-up views for horizontal and vertical orientations. A small bug in this version prevents the Detail tab from appearing until you first select the Frequency tab and then click the OK button. After that, the tab will always show up. The company is fixing this bug for the next release. Noiseware’s Settings pull-down menu lets you select a preset such as Landscape, Night Scene, Portrait, or Film Grain Effect, as well as quite a number of other specific settings that you can adjust. In addition to working with either 8-bit or 16-bit images, this filter also features an automatic noise profiler, which can record your settings for future use. This feature is incredibly important for people who edit multiple images simultaneously and who are forced to keep track of image modifications. While I worked with Noiseware’s Pro version, there is also a less expensive standard version of this plug-in with fewer capabilities. If you don’t need batch processing, and you don’t work with 16-bit images, it’s probably the better choice. However, most photo pros will likely want to spend the extra $20 for the flexibility the enhanced program provides. Noiseware 4.0.1 is a must-have plug-in for digital photographers that offers a far greater range of adjustments than the noise reduction filters that ship with Photoshop. It provides better detail and overall noise control than Photoshop’s pixel sharpening or blurring filters. The detail enhancement controls are especially helpful, allowing you to quickly and easily maintain sharpness.